Hasbro's Ultimate FX Lightsabers are designed to look and feel as cool as some of the more expensive lightsaber collectible replicas on the market, but at a fraction of the cost. In addition these are constructed for children to play with, not to sit on a collector's bookcase. 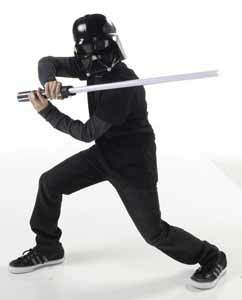 They come in two varieties: Anakin Skywalker's lightsaber and Darth Vader's lightsaber (which is the one we reviewed). A word of warning for adults... search around in the box for the instructions (skip this bit if you're under 14 years of age, because you'll instinctively know how to use this toy) because when it comes neatly packaged in its box it's set to "try me" mode (designed to save battery power when people are pushing the "test" button before buying it in the shops). If you play with this on "try me" mode it won't act as intended and will switch off pretty quickly. Even knowing there was an "on" button, myself and three other adults couldn't find it. In the end an eight year old picked it up and found the switch immediately. That's the first time I felt old. The detailing is pretty impressive and the blade measures 60 inch (which isn't as long as a regular lightsaber, but as it's designed with play in mind any longer would have had children knocking things over and generally being in danger of breaking something. To switch it on you press a button on the handle. This then sends a wave of red light up the clear shaft (to make it look like the blade is growing out of the handle) as well as a powering up sound. It then hums until you move it, when it makes a satisfying whoosh sound. Then if you hit something with it (like a friend's lightsaber) it makes a clashing sound and the light flickers. Finally if you press the button again it powers down with accompanying sound and lighting. The sound effects are all authentic sounds that kids will remember from the movies. And this acts as close to a real lightsaber as you could possible hope. There seems to be some confusion online as to the price of these, but they appear to sell for around the £30 mark, which is pretty cheap for the amount of fun that can be had waving it around and pretending that you're Darth Vader. This is the sort of toy that dad's will buy for their kids wishing that there had been something just as cool when they were growing up. If you're a Star Wars fan then you should own one of these.